Reading Pairs is a very easy 2 card combination beginning with the first card #1 and the last card #36. In the image I have identified the pairs for all 36 cards but you may not be able to see given the size of the actual layout. If you click the image you can view a larger size. Next time, I will have to remember to increase the size of the font as I did in the second image. I have written about the Pairing technique before so I don’t need to go over it again. What I want to talk about today is reading the Pairs as you read the entire layout beginning with the Sweetheart or Lover. It is easy when the image cards are marked. I would include this type of delineation for an Email Reading but probably not if I was doing a personal session unless I created a chart beforehand to help me remember the Pairs. The main objective of today’s exercise is to stretch those cartomancy muscles. 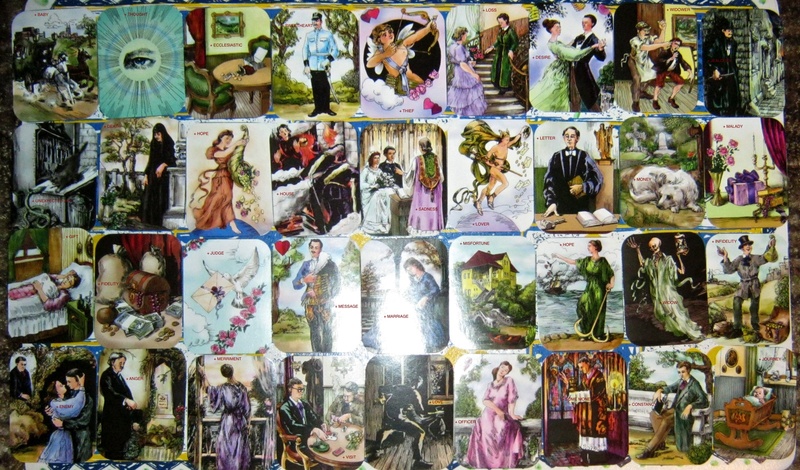 I will focus on the some of the cards with the LOVER to briefly demonstrate what I’m talking about. Now Column: LOVER is paired with MESSAGE. This male is the recipient of some news. OFFICER paired with SWEETHEART reveals that the special lady in his life has eyes for another man. MISFORTUNE paired with HOUSE right above the Lover reveals he is thinking about a situation which is urgent in nature connected to his family. Maybe he is in a state of panic because of what he just found out. LOSS paired with VISIT below the Lover suggests someone wants to talk to him very shortly. The discussion will fail. If you look at the first image you can see the VISIT card follows the LOVE card in the top row so we know this discussion is about someone he loves (Sweetheart). Next Column: LOVE paired with THIEF indicates the male will experience a threat to his love life or emotional security caused by OFFICER/Sweetheart. SADNESS paired with MARRIAGE to the right of Lover. This is a very important meaning because MARRIAGE paired with SADNESS sits right above it. There is a double emphasis on this situation coming up within the next week or so. The male will be very unhappy and disappointed with his relationship. THIEF paired with LOVE shows the man will not be in a winning position even though the SWEETHEART card follows (see first image). The Sweetheart is thinking about the Officer. To be a master Gipsy card reader you must understand the Voice of each card.